Yesterday we learned that Donald Trump’s often mocked, widely despised, and blatantly white supremacist White House senior adviser Stephen Miller has had another rough go of it in a restaurant. Last month someone confronted him at a Mexican restaurant and called him a “fascist.” Now a bartender has followed him out of a restaurant and given him two middle fingers. Popular Congressman Ted Lieu couldn’t help but rub it in Miller’s face. Stephen Miller keeps running afoul of mainstream Americans when he’s in public because he’s one of the primary architects of Donald Trump’s immoral and illegal policy of kidnapping immigrant children from their parents and locking them in cages. 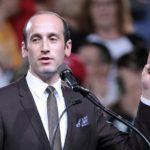 While every political figure is disliked by someone out there, Miller and Trump’s other racist advisers are facing particularly strident pushback whenever they step out in public. It’s not that Ted Lieu is trying to toot his own horn. Rather he’s spelling out the contrast between how mainstream Americans view political figures who are on the right side of humanity, and how they view political figures who dwell in Donald Trump’s gutter. Lieu has also been vocal in trying to force various Trump officials to resign over their roles in Trump’s immigrant child camps.